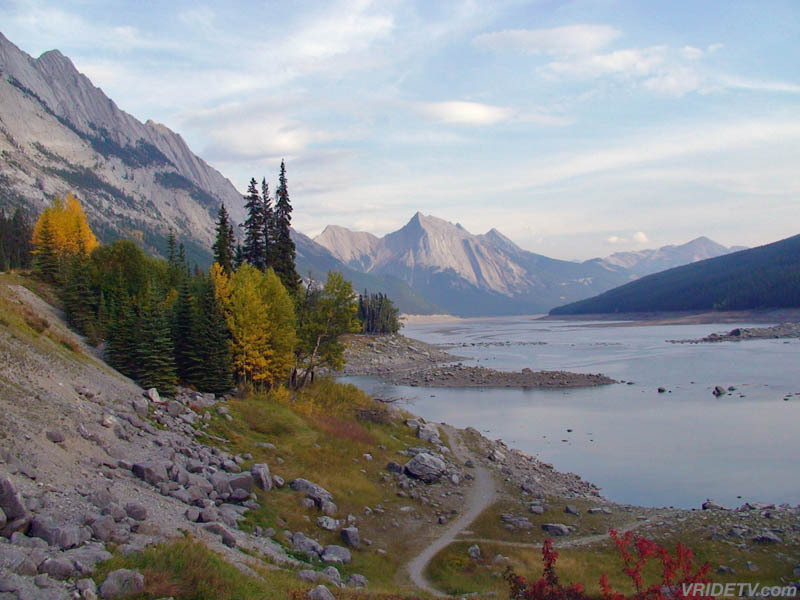 There is nothing quite like traveling in Canada with its abundance of breathtaking scenery, glacier kissed lakes, and diverse geography, from the high-altitude ear popping Rocky Mountains to the forever-flat lands in Saskatchewan. 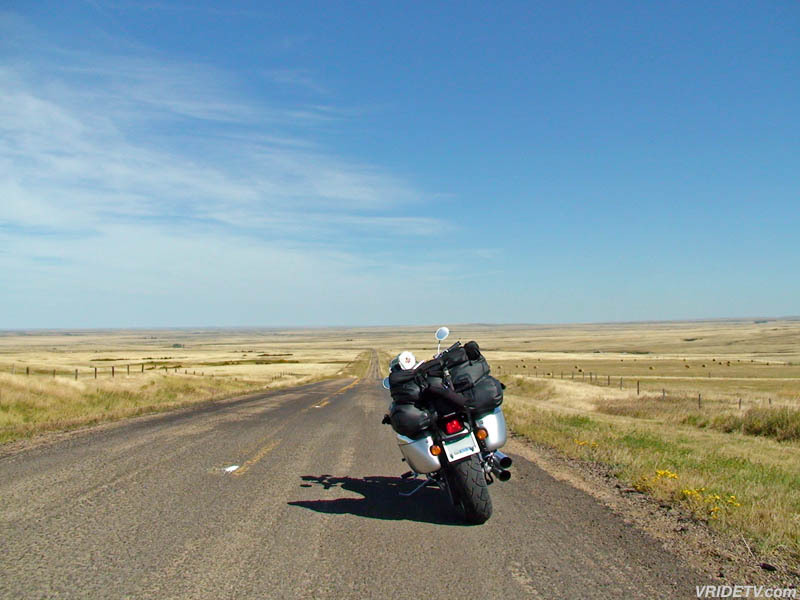 To travel across Canada by car is incredible, but nothing captures the sights, scents, and sounds of Canada better than seeing it from behind the handlebars of a motorcycle. Jeff Pennock from Vridetv.com, started riding with his first dirt bike at the age of seven and has never stopped. That beat up, Yamaha dirt bike fueled his lifelong passion towards riding and today Jeff rides with an impressive 40 years of experience. 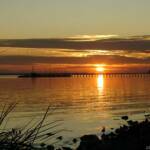 Even a near-fatal motorcycle accident in 1998 has not taken away his desire to ride and explore. 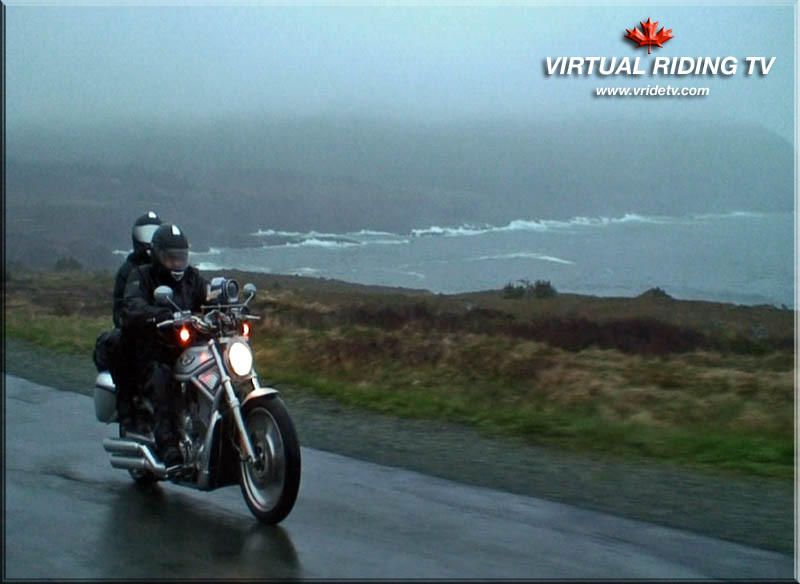 Jeff’s new project, which is called Virtual Riding Television (or Vridetv for short) mixes Jeff’s passion for riding with his talents in videography and photography. 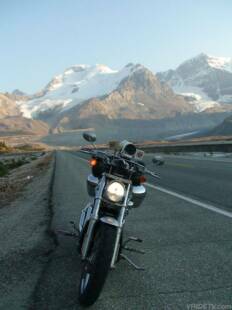 One of Jeff’s best experiences was riding across Canada, something which, even for local Canadians, few can claim due to its great distance and unforeseeable weather conditions. 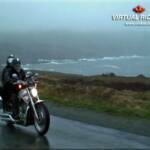 Jeff rode 18,786 kilometres across Canada and back in 2006 and captured some amazing footage. While the optimal time to leave for a massive trip like this would be the middle of summer, due to some timing issues, Jeff and his wife Diane, had to start their trip on April 27th. Thanks to their early departure Jeff and his wife were forced to ride through some heavy rain, cold, and even some thunder showers, proving why most people ride across Canada in July or early August. Though that didn’t put a damper on their trip, while there were a few bad weather spots, they still witnessed some amazing sites. The beautiful thing about riding through Canada is that each province has its own unique characteristics and geographical traits yet still contains the renowned friendly and helpful Canadians. 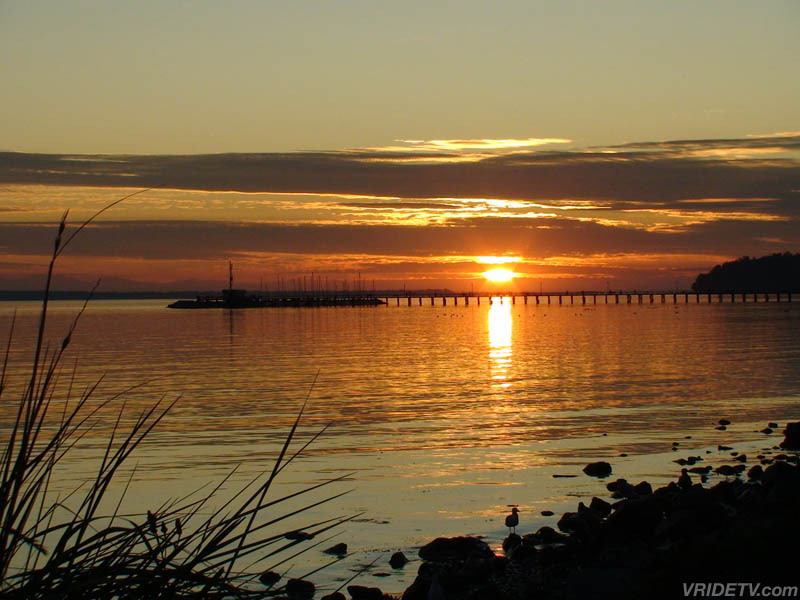 Within each province you can either stop at the plentiful awe-striking points-of-interest or rip up the roads that are seemly placed on top of untouched scenery or guide you through historical city locations, such as in Eastern Canada. 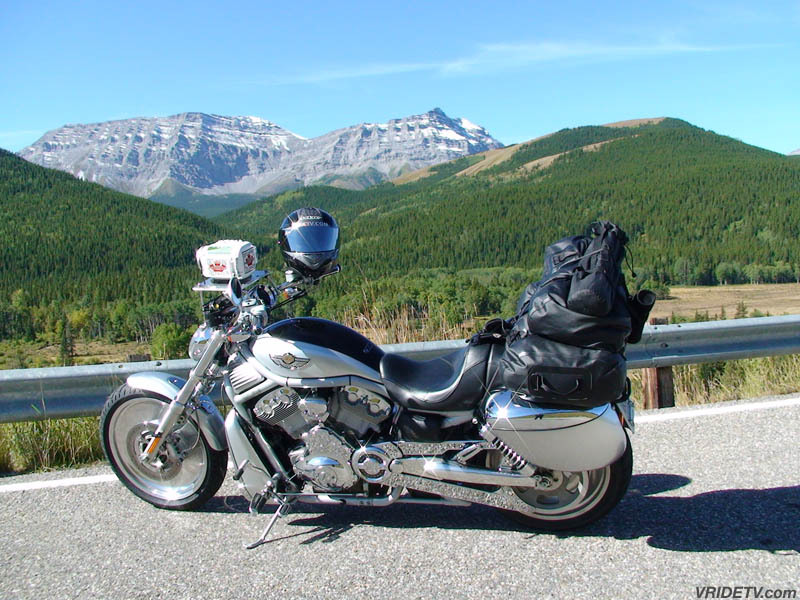 Even though Jeff has experienced the beauty of every province, he still prefers riding from his home province of British Columbia through neighbouring Alberta most of all. 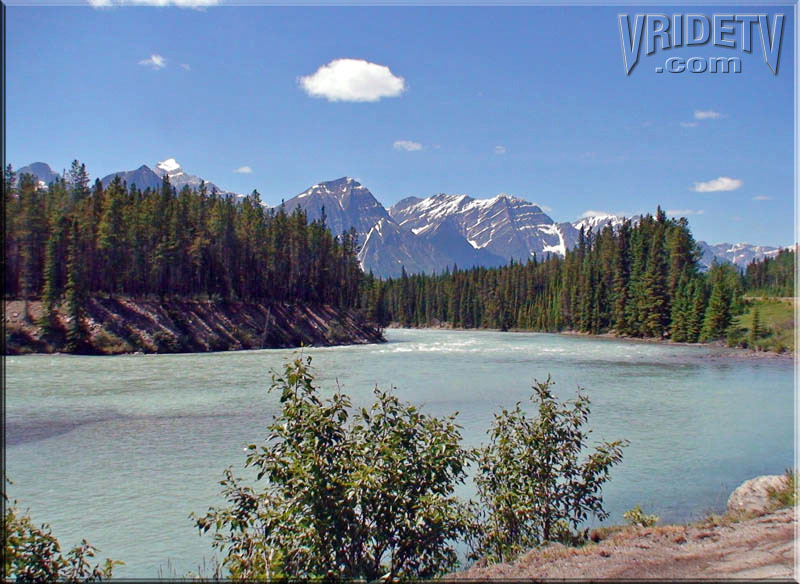 One of his favourite areas to film, the Rocky Mountains, holds some of Canada’s and the world’s most highly sought after travel destinations including, Jasper National Park, Banff National Park and the Columbia Icefields. 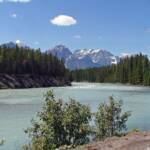 The Icefields Parkway, Highway 93, carves its way through the above mentioned parks and is one of the most spectacular roads that anyone could ever want to travel upon. 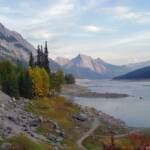 Jeff reveres this area as the crowning jewel of travel destinations in Canada containing an abundance of breathtaking points-of-interest, glacier fed pristine rivers and lakes, untouched wilderness, and, if you are lucky, you will see some wildlife.. If you are spending a few days in the Rocky Mountains, it is a great idea to take a helicopter or plane ride from one of the tour companies in the area. As stunning as the scenery is from the roads and trails, seeing it from the air adds a whole new dimension to the experience. From the air you see the true ruggedness and beauty of places that you cannot see from the road and places that few have ever even seen. 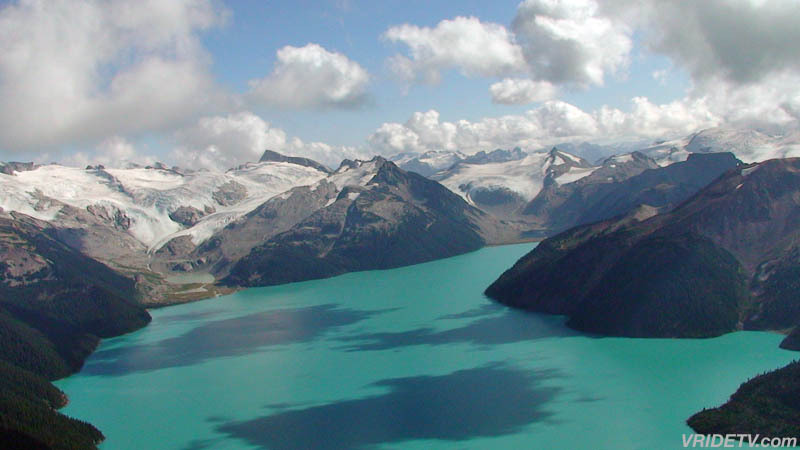 The surreal blue-green glacier fed lakes, cascading waterfalls, and forbidding terrain are some of the most unique features in the area and from the air you are able to capture it all. It is one thing to experience the sights but Jeff wanted to capture the memories on camera and share them with the world, to do this he operates three different cameras with three very different responsibilities. His primary camera the Sony HDR-HC3 captures a virtual riding experience, thus the inspiration for the title of the project, through a custom made handlebar mount enclosed in a waterproof container. This camera captures the twisty-turns, the insane weather changes, and the various wild creatures that Jeff meets along his way. To give a point-of-view experience, Jeff purchased the new Sony HXR-MC1 which he mounts on another custom bracket on the side of his helmet. This camera captures scenery and action that his permanently mounted front camera may miss such as a majestic green-blue roadside lake hidden in-between a mountain pass or a soft orange sun sneaking behind the snow tipped Rockies. Amazingly, his little helmet cam still captures in high definition to capture every detail of his adventures. The third camera is the Sony HDR-HC9. Jeff takes his third camera with him for those quick grab moments when he needs to make a quick pan shot, tripod and setup work, or to capture some in-the-moment pictures or video. 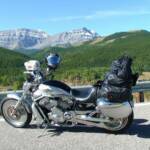 Probably the most vital piece of equipment for Jeff is his Motorcycle which is a 2003 100th anniversary Harley-Davidson V-rod VRSCA. While most would not consider this bike the ideal long-distance motorcycle, he uses this bike because of its high performance engine, 136,000 kms and counting of reliability, and smooth lightweight handling with similar characteristics to a sport bike. 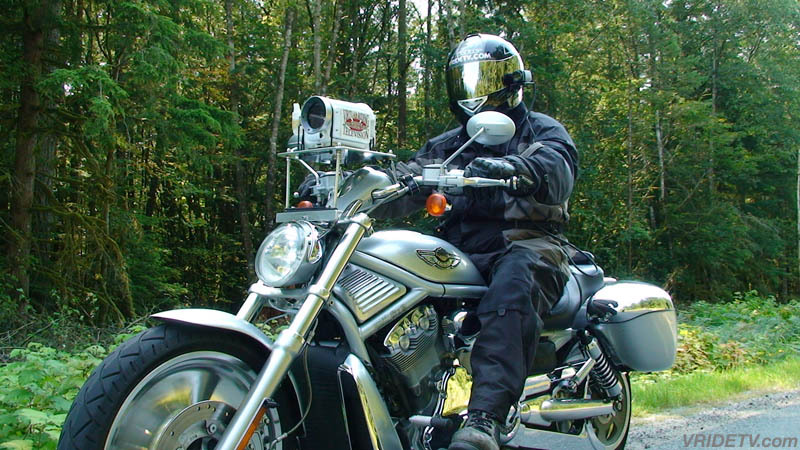 Using the V-rod for this purpose does have its challenges including the small 3.7 gallon fuel cell, the small stock hard saddle bags, and the solid front wheel, which catches the wind like a sail. Overall though, the roads in Canada make a sportier bike, that much more fun. In order to accommodate for the rapidly changing weather conditions that traveling through Canada can present, Jeff has to choose his equipment carefully for he has very minimal storage capabilities. His trip across Canada was accomplished without the luxuries of a chase vehicle or support staff so careful planning had to be done. While a surprising amount of space is taken up by camera equipment, including a tripod and tapes, Jeff still has just enough room to pack the bare essentials. He packs most of his equipment in his saddlebags and a waterproof duffle then carries extra batteries, tapes, lenses, and the control unit of the helmet cam in his custom made camera harness. It is important, especially in the dynamic weather conditions near the Rockies, that you do not assume that just because it is sunny or rainy, that it will stay that way. Jeff packs layered clothing so that he can quickly pull over and adapt his apparel to the changing conditions, it is normal for the weather to rapidly cool down or warm up, so it is a good idea to stay prepared. Other vital things include a credit card, cash, food/protein bars, and heated liners. It is also not a bad idea to carry a satellite phone as the most beautiful locations are often quite a ways away from any cellular towers. Jeff prefers the secluded lone-road travels which put him far away from city life and through roads which cut through places which many animals call home. 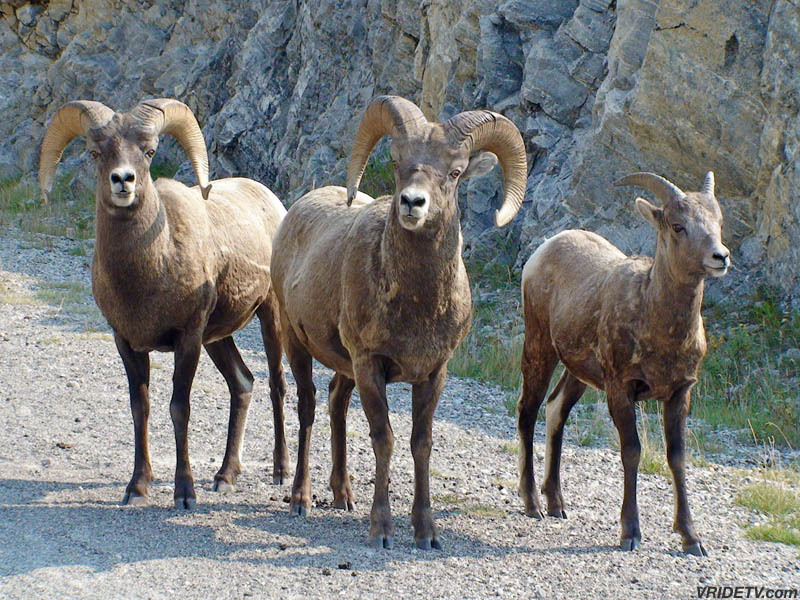 Black bears, mountain sheep, deer, elk, mountain goats, and many kinds of birds are not uncommon on his trips through the Rockies. Jeff has the ability to get surprisingly close to these animals to capture some great footage. 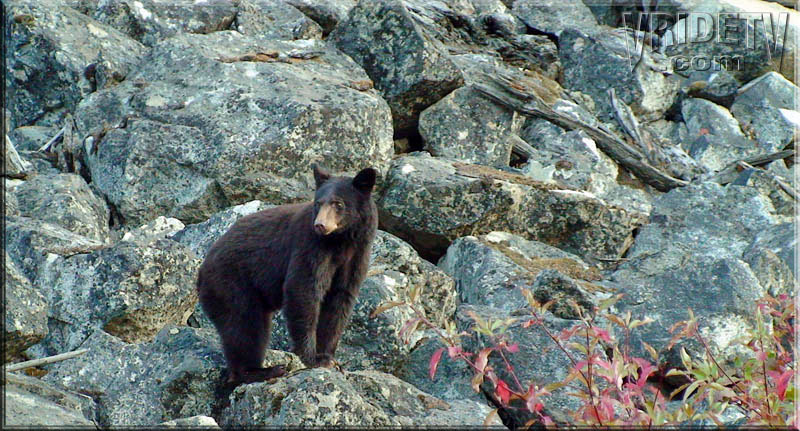 Most people would not even think about stopping when they see a black bear, yet when Jeff sees a black bear, it is time to grab that video camera and get a closer look. His appreciation for wildlife is apparent in his footage, with the diverse and pristine wilderness many of the Canadian roads carve through, Jeff finds countless new animals to place in his video library. 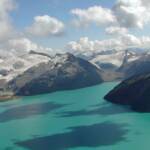 If you enjoy wildlife, Canada’s untouched wilderness makes it easy to find various animals on your travels.